1) Bad Taste - Makes moles' food hard to digest. 2) Bad Smell - Strong to them, but mild to us. 3) Less Food - Reduces the insect and grub populations that the moles feed on. These changes to the mole's environment drive them out of the application area with no harm to people, pets or wild animals. EPIC Granular Repellents are easy to use. 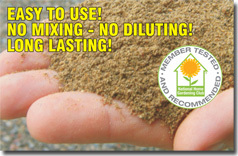 There is no mixing or spraying and no expensive equipment or maintenance required. The product is simply sprinkled on the ground or poked into the mole holes. As a bonus to both you and your customer, there is no bad odor during or after application. When you determine the cost of our granules per linear or square foot, our products will provide more protection at a lower cost to you than other leading brands. • Stops moles from returning – Guaranteed! MOLE SCRAM is organic and environmentally-friendly, is effective for extended periods and is safe for pets, animals and children. MOLE SCRAM comes in a dry, granular form. This product works by driving moles from affected areas. Simply apply the product in areas that you want the moles to exit from. When possible, punch holes in the tunnels and sprinkle in some product every 10 feet or so. Apply 1 lb. per 750 square feet. Please see more detailed application instructions here or at the bottom of the page.